The Emulsiflex C3 is a high pressure homogeniser designed for lab scale production of nano particles and micro emulsions. The homogenising pressure is adjustable between 500 and 30,000 psi. This wide pressure range means that many materials can be processed efficiently in a single pass. This provides the capability of scaling up to an integrated continuous process. The C3 homogeniser is powered by an electric motor with a constant flow capacity of 3.0L/hr. 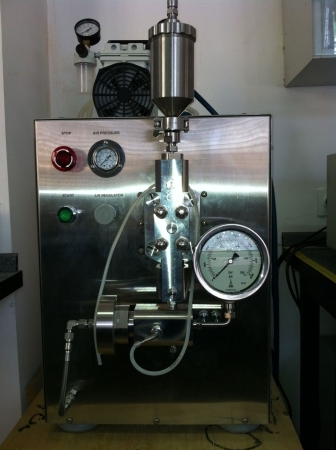 The flow rate is independent of pressure. Samples as small as 10ml can be processed.